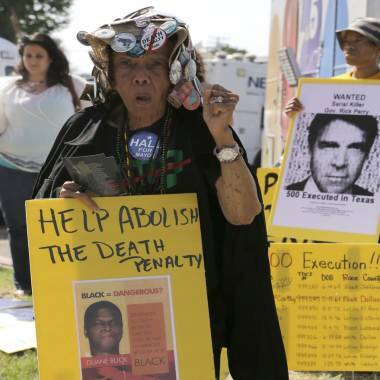 Jean Wilkins Dember, 83, joins others Wednesday, June 26, as they protest the 500th execution in Texas outside the Texas Department of Criminal Justice Huntsville Unit. Kimberly McCarthy was set to be executed Wednesday evening. Texas on Wednesday executed its 500th inmate since it reinstated the death penalty in 1982, passing a grim milestone in the state that has executed more prisoners than any other in the country. As a few dozen protesters gathered outside the prison in Huntsville, Kimberly Lagayle McCarthy, 52, was put to death by lethal injection at 6:37 p.m. (7:37 p.m. ET), according to the Texas Department of Criminal Justice, making her one of a small number of women to have been executed. John Hurt, a spokesman for the Texas prison system, told The Dallas Morning News that McCarthy joked with prison staff and was "not downcast" in her final hours. She was offered the same meal as other inmates: pepper steak, mashed potatoes with gravy, mixed vegetables and white cake with chocolate icing. McCarthy, a former cocaine addict, was convicted of killing her 71-year-old neighbor during a 1997 robbery. 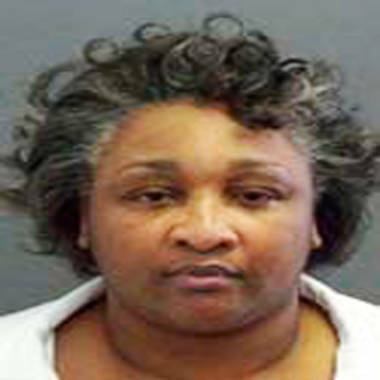 She was found guilty of using a butcher knife and a candelabra to beat and stab retired college professor Dorothy Booth. Using the same knife, she severed Booth's finger to steal her wedding ring. McCarthy was granted a retrial by an appeals court in 2002 on the ground that police had obtained her confession illegally, but she was sentenced to death row again. Members of Booth's family say they don’t care about Texas' macabre tally, only about justice for their loved one. "The only significance for us is that Kimberly McCarthy, because of her crack cocaine addiction or her sociopathic personality, deprived us of Dorothy Booth," Randy Browning, Booth's godson, told The Dallas Morning News. "Whether it's the 500th or the 5,000th, it doesn't matter." Browning had said he planned to attend the execution Wednesday evening. A death row inmate is executed every three weeks in Texas, a rate that far exceeds that of any other state. Texas is the leader in executions in the U.S. by about 400, with Virginia a distant second. Since the Supreme Court ruled on death penalty laws in 1977, Texas has accounted for 40 percent of the more than 1,300 executions nationwide. Despite a cultural shift away from the death penalty in many parts of the country, 32 states still allow it. The rate of executions has declined in recent years in Texas, as well. More than three dozen people were executed in 2000, but this year, McCarthy will be the eight person subjected to capital punishment. Kimberly McCarthy in an undated Texas Department of Criminal Justice photograph. But many Texans support the death penalty, according to a 2012 poll by the Texas Tribune and the University of Texas. Only 21 percent said they were opposed. Gov. Rick Perry is among the majority. "I think our process works just fine," Perry said in 2012 during his unsuccessful presidential bid. "You may not agree with them, but we believe in our form of justice." McCarthy will be the first woman put to death in the U.S. in more than three years and the 13th since the Supreme Court's ruling. The last woman executed in the U.S. was Teresa Wilson Lewis in Virginia on Sept. 23, 2010. In the past year, McCarthy’s execution had been pushed back twice, most recently in early April. Her attorney, Maurie Levin, continued to fight for McCarthy, but her latest appeal to the Texas Court of Criminal Appeals was rejected Tuesday. Levin said black jurors were improperly blocked from McCarthy's trial, a claim the convicted woman made in her appeals. "The shameful errors that plague Ms. McCarthy’s case — race bias, ineffective counsel and courts unwilling to exercise meaningful oversight of the system — reflect problems that are central to the administration of the death penalty as a whole," Levin said. McCarthy's trial was decided by an all-white jury despite Levin's claim that four non-white jurors qualified. McCarthy is black, and Levin said the Dallas County jury selection process has a "troubling and long-standing history of racial discrimination in jury selection." There are currently 283 men and women on death row in Texas. M. Alex Johnson of NBC News and The Associated Press contributed to this report.